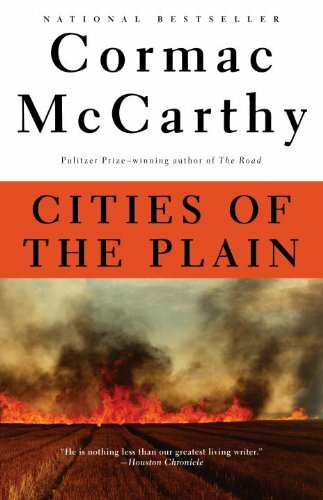 Cities of the Plain is the most focused of The Border Trilogy. It’s less grandiose than All the Pretty Horses, and less ponderous than The Crossing, but extraneous elements which either dragged or elevated the preceding books — depending on your point of view — have been removed: the prose is smoother; there are (fewer) page-long discussions with wise strangers imparting wisdom; there is less rumination on the landscape. This is because this novel is more eager to focus on two subjects more directly: obsession, and the world’s disregard for what you think it should be. Modernity has swept into McCarthy’s South West. Cars are as common to see as horses, and the lights of cities in the distance are ever-present. The army is trying to claim the land our protagonists live upon. A sense of dread hangs over proceedings like storm clouds. John Grady Cole and Billy Parham return. They occasionally venture across the Mexican border, which unsurprisingly does not, as those that have read the preceding books can guess, keep their lives simple. Cole’s fixation on a young prostitute showcases his naivete and with Parham’s dry wisecracking mouth at his side he comes across as more relatable than the confident horse-whisperer of the first book. He is out of his element here, and more interesting for it. The dual-protagonists play off each other in funny and tender ways, echoing lost relationships from the last books which might otherwise have been forgotten, giving a sense of poignancy to the events. There’s a great sense of suspense as the novel falls into place, the feeling that things cannot end well. When I put it down after finishing I felt catharsis. It’s a great end to an inspired, occasionally fun but deeply sad series that I enjoyed a massive amount. Highly recommended.